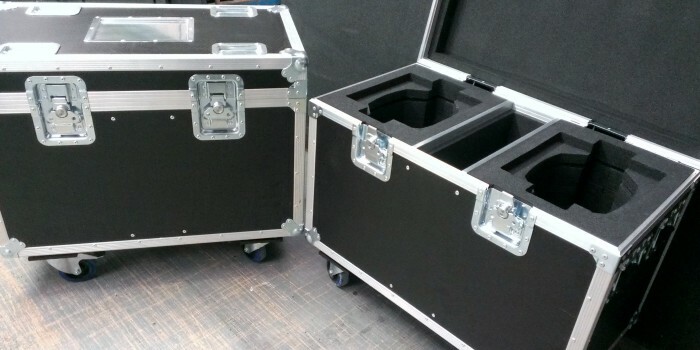 Condor Cases Ltd is able to manufacture unique highly engineered custom flight cases to suit your needs. The images show custom-engineered cases to house seamless pit walling panels and the associated components for the motorsport industry. Due to the size of these cases, the combined weight of items going inside and the complexity of the internals, a complete rethink on how we made flight cases was needed. Because of the weight going into the case, we went with a tubular steel frame to create the basic structure of the case. Inside this frame, we used a combination of CNC routed white nylon and v-cut and folded lightweight polypropylene panels to create various slots and compartments for the customers equipment, all finished off with a CNC routed Black nylon fascia. Underneath you will find aluminium forklift runners and 200mm heavy-duty castors with a load rating of 800kg, fitted to a special made removable castor plate and bolted though into the steel frame structure. 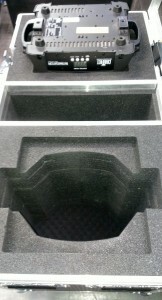 This is all then clad in a heavy-duty polypropylene honeycomb panel and finished off to look like any other flight case. For further information or to discuss your requirements, contact us at sales@condor-cases.co.uk or call us on 01525-540021. 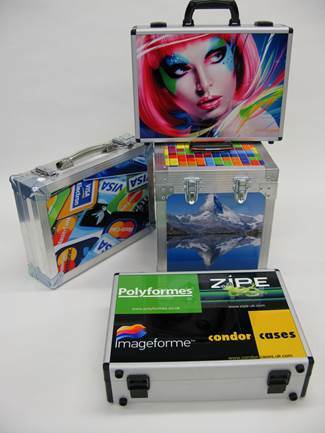 Condor Cases offer a full range of bespoke, custom and branded flight cases. With over 20 years of experience, all of our cases are designed and manufactured in house at our production facility in Leighton Buzzard. The Condor Colour Case, or the “T. C.” as we affectionately know it, is available on all styles of case, including trunk, screen or rack. 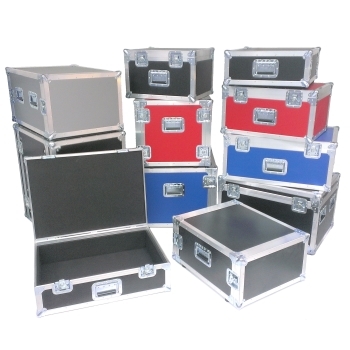 With no minimum quantity, the “T.C.” provides for the most stunning, cost effective, branded, flight case combinations, without having to compromise on quality or strength. One of the many lighting flight cases being manufactured at Condor Cases Ltd, the flight case shown will securely and safely transport two of the Chauvet Intimidator 350 lights with space in the centre to store all your cables. These cases are made using a strong 9mm birch plywood hexagrip panel and are fitted with castors for easy transportation. Theyalso have castor dishes in the top panel, for the cases to be safely stacked on top of each other for better storage. Inside the case you will find CNC routed foam inserts and a soft eggcrate foam on the bottom panel to hold the moving head of the light securely in the flight case. 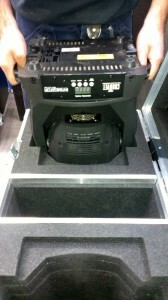 For many years, Condor Cases have been designing and building quality flight cases for a variety of industries. 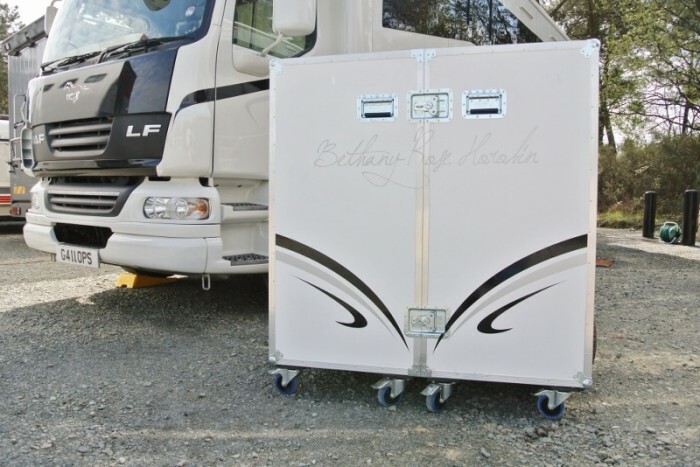 Using that experience, we have been able to adapt the basic flight case design to offer double & single tack lockers to professional and amateur horse riders, allowing them to transport all their tack & equipment safely to and from various shows and events. These tack lockers can be configured internally in many different ways to suit each individual rider, allowing them organised, fast and easy access to all their equipment. 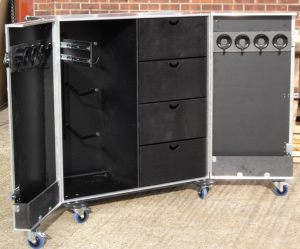 So have a look at our tack locker page http://condor-cases.co.uk/custom-flight-case/tack-lockers/ or call us on 01525-540021 to discuss your needs.